The success principle behind the Serendipity Store PAULINA’S FRIENDS – flirting with chance! This book is a guide through the exciting world of chance: a poetic-philosophical collection of questions, insights, statements from friends of the concept gallery & agency PAULINA’S FRIENDS. The book illuminates the phenomenon of chance interdisciplinary and synergetic: how different people from different professional milieus experience chance, shows us the statements of the 35 co-authors. Can we plan our lives randomly, and even succeed in business thanks to chance? A completely absurd idea in a society optimized to perversion prosperity. By chance, we learn to say yes to what is. This book shows us how we creatively use the power of chance. 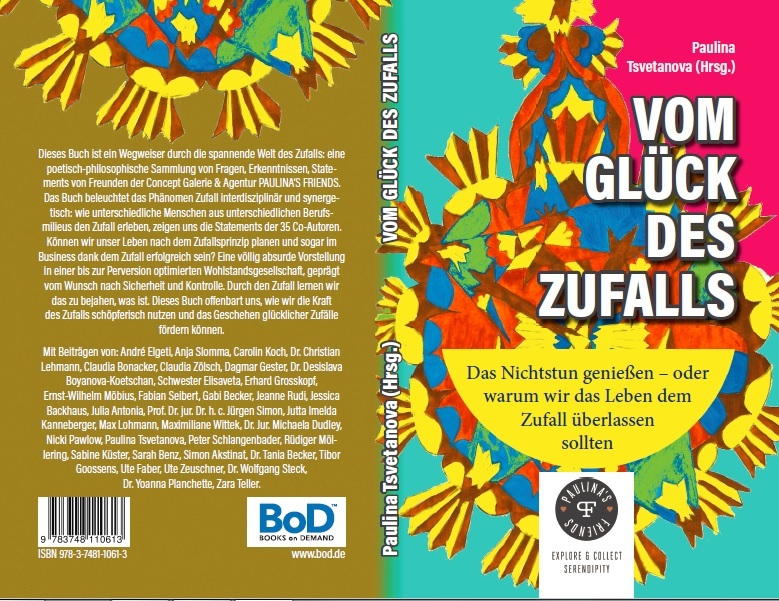 André Elgeti, Anja Slomma, Carolin Koch, Dr. Christian Lehmann, Claudia Bonacker, Claudia Zölsch, Dagmar Gester, Dr. Desislava Boyanova-Koetschan, Schwester Elisaveta, Erhard Grosskopf, Ernst-Wilhelm Möbius, Fabian Seibert, Gabi Becker, Jeanne Rudi, Jessica Backhaus, Julia Antonia, Prof. Dr. jur. Dr. h. c. Jürgen Simon, Jutta Imelda Kanneberger, Max Lohmann, Maximiliane Wittek, Dr. Jur. Michaela Dudley, Nicki Pawlow, Paulina Tsvetanova, Peter Schlangenbader, Rüdiger Möllering, Sabine Küster, Sarah Benz, Simon Akstinat, Dr. Tania Becker, Tibor Goossens, Ute Faber, Ute Zeuschner, Dr. Wolfgang Steck, Dr. Yoanna Planchette, Zara Teller. ORDER THE BOOK iN GERMAN HERE!